Gain a deeper understanding about how North Portland Parks and Open Spaces intersect and interact with all of the water (Willamette River, Columbia River, Columbia Slough, etc.) surrounding North Portland, during an evening of information sharing and artistic expression. 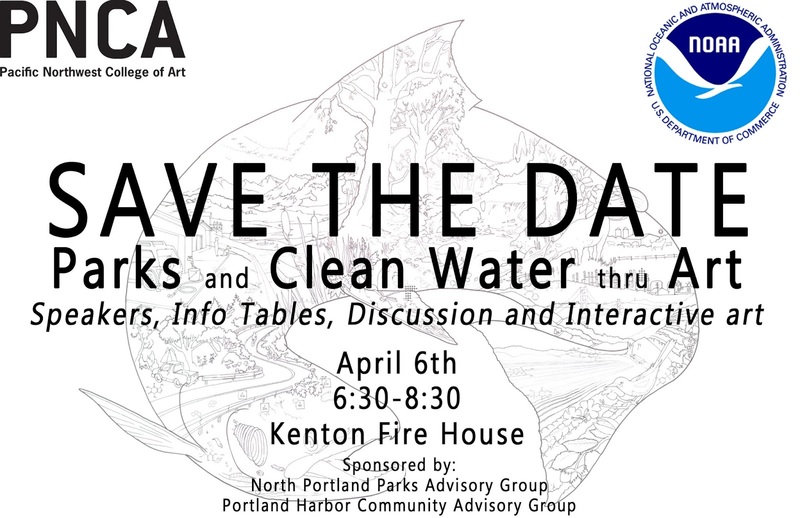 The National Oceanic and Atmospheric Administration (NOAA), the Environmental Protection Agency, the City of Portland Bureau of Environmental Services, Willamette River Keeper, and many more will present information on the intersection of clean water, parks and art. 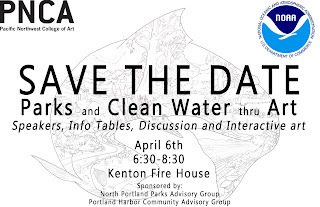 Pacific Northwest College of Art will showcase some art that helps us change our thinking and behavior about clean water and all others will be talking about how we can advocate for clean water as we advocate for North Portland Parks. Here is a link to the 2013 collaboration between PNCA and NOAA that got this started.